Aging of your upper eyelids can have an unfavorable effect on your overall appearance. Excess skin and sagginess can make you look older than you are, and make your eyes appear tired and aged - all of which can be addressed through eyelid surgery in New York. Upper eyelid surgery, potentially an eyelift, upper blepharoplasty or brow lift, as performed by Dr. Westreich, one of New York’s leading board certified facial plastic surgeons, can reverse these changes. The procedure will leave you looking and feeling years younger. Your entire face will appear substantially more awake and alert, as the skin surrounding your upper eyelids is rejuvenated. Changes to the eyelid region can occur as a result of sun damage, aging, and environmental factors. Of central importance in evaluating the upper eyelid is the position of the eyebrow. As forehead skin sags, the eyebrows drop, a phenomenon called brow ptosis. The forehead muscles become overactive in order to keep the brow skin off the eyelid skin. This may cause increased wrinkling and headaches at the end of the day due to prolonged muscle activity. Eyelid rejuvenation is a complex process that requires experience and accurate diagnosis in order to achieve natural and pleasant results. Ptosis, or a drooping eyelids, refers to an upper eyelid that falls lower than it should. It is often associated with the presence of excess skin in the upper eyelid and may affect one or both eyelids. Ptosis can be accompanied by additional symptoms including watery eyes, tearing and compromised vision. As a double board certified facial plastic surgeon who specializes in cosmetic eye surgery, Dr. Westreich is experienced with surgical techniques that allow him to lift one or both eyelids and reposition them in a youthful manner. This type of upper eyelid surgery is intended for patients whose extra upper eyelid and eyebrow skin make the eyes appear smaller and worn out. Sagging skin at the top of the eyelid region and forehead can significantly weigh down a patient’s eyes when the eyebrows flatten. Small incisions in the hairline are used to free up the forehead and eyebrow tissues, which are then suspended in a higher position. This helps to diminish forehead lines, take weight off the upper eyelids, and treat excess skin in that area as well. In this procedure, NYC facial plastic surgeon Dr. Westreich will lift the eyebrows and temple region, so as to eliminate extra hanging skin folds and rejuvenate the eyebrow position and shape. Or Upper Lid Blepharoplasty in NYC is typically used to remove excess skin to help re-define the upper eyelid crease. The length and specific contour of the incision is determined by the degree of extra skin and its position in relation to the eyelid itself. Minimal fat removal in the central aspect of the upper lid can also be part of the surgery. Having “double eyelids” has come to mark a significant aesthetic concern among Asian patients. Having single vs. double eyelids is a genetic trait, and affects about half of the Asian population. Restoring a defining crease in the eyelids can make the eyes appear noticeably larger and more dynamic. As the name suggests, lower eyelid surgery is directly targeted at the skin under the eyes. The procedure can be performed alongside upper eyelid surgery for more complete results. For more information on lower eyelid surgery, click here. Candidates for an eyelid surgery in New York generally have loose, sagging excess skin that is detracting from a patient’s youthful appearance. Some candidates for the procedure are older and the heavy look on the upper eyelids from sagging skin exaggerates their aging. As long as the skin on the upper eyelids is relatively elastic and the patient is in good overall health, an upper eyelid surgery by Dr. Westreich can be a viable option to refresh your appearance. With more substantial excess, brow surgery may be required. You can rest assured that your procedure will give smooth, natural looking results that you will be excited to show off to the world. Dr. Westreich will remove exactly the right amount of fat and skin off your upper eyelid, so that you will not look permanently shocked and so that your results do not appear fake or exaggerated. Furthermore, Dr. Westreich understands the importance of a hidden incision, especially when it comes to blepharoplasty in NYC; he knows that any unsightly residual scarring would be directly visible on a patient’s face and therefore expressly places the incision in the least detectible location. If you are considering an eyelid lift, we encourage you to meet with Dr. Westreich. Leveraging his extensive training and education, Dr. Westreich expertly performs upper eyelid surgery in NYC to enhance the appearance of the eye region and ensure clear vision for years to come. Dr. Westreich’s approach is conservative in that he never over-operates, thus preserving the natural spontaneity of the eyes as they smile, as well as the integrity of the full range of human emotions. The end results is that friends, family members and co-workers may remark on how well-rested you seem, and on how attractive, without necessarily guessing you’ve had cosmetic work done. The first step in undergoing upper eyelid surgery in NYC is to set up your private consultation in the comfort of Dr. Westreich’s NYC office suite. There he will examine your eyes, take note of previous cosmetic and/or medical procedures, catalog any medications you are taking, and begin to answer your most pressing questions and concerns about the procedure. Dr. Westreich will then formulate a unique treatment plan customized to your individual issues. Our library of before and after success stories is a vital tool in helping you to move forward with confidence. You can select the results that you find most appealing, and this can assist Dr. Westreich in better understanding your aesthetic tastes. In addition, advanced computer imaging may be used as part of the consultation process to offer you a better chance of visualizing your outcome. Where Does Surgery take Place? Although Dr. Westreich retains hospital privileges at multiple facilities around the city, he is pleased to offer surgery at an accredited outpatient center in NYC or in our office, depending on the procedure type. Eyelid surgery is performed under the strictest safety protocols, and makes use of our state-of- the-art technology and surgical equipment, as well as our friendly, experienced staff. Most of our staff members have undergone cosmetic procedures themselves and know the value of setting you at ease. They are eager to realize your aesthetic dreams and ensure your stay is productive, rewarding and peaceful. In most cases, patients return home on the same day as their eyelid surgery and take at least one week off from work and other regular activities. Dr. Westreich usually removes the stitches within 5 to 7 days following surgery during a post-surgical appointment. There is usually a moderate amount of swelling and bruising in the eye region after the surgery, so many of our patients prefer to stay at home during the first week of their recovery. Most of the swelling and bruising dissipates by the end of that week, although it is normal for a small amount of swelling to linger for up to 6 weeks. Dr. Westreich advises his patients to avoid things that may increase the risk of bleeding, such as vitamin E, fish oil, excess dietary salt, and aspirin. Patients should also refrain from strenuous activities and exercise for several weeks, as these activities can increase swelling, even after it has initially subsided. Your consultation visit is the crucial first step on the journey to your new look. This is your one-on-one time with Dr. Westreich to ask any questions and address any concerns about moving forward with your upper eyelid surgery. As always, Dr. Westreich wants you to feel fully comfortable under his care, and will provide you with his completely honest, unbiased opinion every step of the way. As a renowned, double board certified plastic surgeon, Dr. Westreich is entirely knowledgeable, experienced, and accredited to complete your surgery. Blepharoplasty, or lower eyelid surgery, is intended to target the area directly under the eyes. Puffiness, eye bags, dark circles and wrinkling under the eyes can detract from a person’s appearance and can make you look older, tired, and worn out. Lower eyelid aging results from excess skin or fat deposits, due to a loss of elasticity or a genetic predisposition, that have accumulated over time. A lower eyelid procedure, as performed in Dr. Westreich’s NYC office, is designed specifically for your personal needs. You will walk out with a refreshed appearance, and will no longer be self-conscious of your under eye appearance. Aging of the midface is a newer concept in which the effect of descent of the cheek fat is seen. Typical changes seen include an oval rather than almond shape to the face, hollowing underneath the eyelids, deepening of nasolabial folds, and increased joweling. Essentially, the apple cheeks of youth are lost. Mid-face lifting is a technique for rejuvenating the lower eyelids and the cheek area through surgery. It can also reduce deepened nasolabial folds, although it will not completely remove them. A mid-facelift can achieve a more youthful, fuller appearance to the cheek and lower eyelid area. In endoscopic midface lifting, Dr. Westreich will place small incisions in the temporal hairline through which the midfacial tissues are freed up and lifted. An Endotine® absorbable implant is used to hold the midface in the new position until the structures are firmly reattached. Dramatic but natural changes to the lower eyelid region and midface complex can be achieved. The midface lift can also be performed at the time of an endoscopic brow lift or neck liposuction. That's why Dr. Westreich is considered to provide some of the best New York eyelid surgery results available. There are different types of eyelid surgery—each of which Dr. Westreich is highly trained in performing—which can significantly alter your appearance for the better. Depending on your particular condition, Dr. Westreich will apply varying methods of surgery. Still, one thing remains constant no matter what type of lower eyelid surgery you are seeking: Dr. Westreich’s devotion to giving you a more reinvigorated, energized look. Early signs of aging typically involve the skin alone. In the lower eyelids, this can take the form of horizontal lines on the eyelid itself. While BOTOX is effective in eliminating the lines to the side of the eye (crow’s feet), BOTOX cannot be used on the eyelid itself. In this case, creams and other treatments cannot tighten the skin enough and removal of excess skin is required. A skin pinch procedure involves removing excess skin alone with a hidden incision underneath the eyelashes (subcilliary incision). No significant tissue dissection is required and minimal bruising or swelling typically results. Patients can typically return to social environments within 1 week. For Manhattan patients not looking to have any type of surgery, non-invasive skin tightening procedures are available. 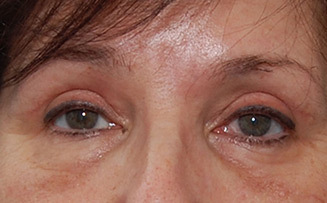 Under-eye bags, especially those that are particularly deep-set, can make you appear unnecessarily tired or sick. They can produce a dark shadow on the region, or dark circles, that can detract from the softness of the eyes and the entire face. Dr. Westreich will remove or restore the lost volume that cause the under- eye bags. All tissue levels – skin, fat, and muscle – can contribute to the appearance of bags. Correction will be performed in the most natural way by manipulating and tightening the tissues under the eyes. Based on the types of tissues involved, the incision may be hidden under the eyelashes (subcilliary incision) or placed inside the eyelid (transconjunctival incision). Puffy under-eyes, like under-eye bags, can be unsightly and misleading. The condition is most often genetic, but can also result from an inflammation of the lower eyelids, prolonged stress, allergies, and fluctuations in the body’s level of hormones. After ruling out reversible medical causes, Dr. Westreich will remove excess under eye fat to decrease the appearance of the puffiness. Typically, this surgery is performed with incision hidden inside the eyelid (transconjunctival incision). Drooping eyelids, also known as ectropion, is an actual medical condition that can have adverse affects on a patient’s vision. Typically, drooping eyelids impact the upper eyelid, but treatment is also available should the condition be present in the lower eyelids. In these cases, the lower eyelid loses contact with the eyeball and tearing or dry eye may result. This is another problem that Dr. Westreich can directly target with surgery. The best candidates for our blepharoplasty in NYC are patients who have relatively elastic skin that has become loose or sagging due to aging, exposure to the sun, or hormonal changes. Most often, this manifests as wrinkling, bagginess, and puffiness directly under the eyes. It is important that patients are in good overall health before committing to the surgery, and that they always maintain realistic expectations. Dr. Westreich will personally evaluate your eyelid concerns during your consultation appointment to see whether or not the surgery is a good option to explore. Dr. Westreich is an accredited and highly rated surgeon who has been featured in several prominent magazines and publications and was recently named New York Magazine’s “Best Doctor of 2014 and 2016.” He is an expert in facial reconstructive surgery, and makes it his mission to develop a lasting relationship with each of his patients. Your consultation will take place in our comfortable office, conveniently located in the heart of New York City’s Upper East Side. This is your time with Dr. Westreich. Feel free to bring in a list of questions you want answered. Dr. Westreich will be there for you every step of the way, leading the path to the new, revamped you. As long as you have realistic goals in mind and are aware of the implications of lower eyelift surgery, we encourage you to call us today at (646) 494-9048 to schedule your initial consultation for arguably the best blepharoplasty NYC has to offer. Can you tell me more about surgery day? On average, the eyelid surgery takes about an hour to two hours to perform, depending on the severity of your condition. During this time, either local or general anesthesia will be administered to maximize your comfort and relaxation. Results of your upper eyelift are designed to be long lasting, and can effective for up to 10 years after a single procedure. How does Dr. Westreich minimize scarring? Dr. Westreich was recently voted by his colleagues to the list of best plastic surgeons in New York. He is extremely cautious when placing the incision of this procedure, as the eyes are a focal point of the face. In general, the incision will be placed at the point of your eyelid’s natural crease, so that scarring is kept to an absolute minimum. If your recovery goes as planned, any scarring will not be readily visible by onlookers and hard for you to pick out several months after surgery. Is upper eyelid surgery covered by insurance? Depending on the intention of the surgery, an upper eyelift may be covered by insurance. If the procedure is sought for aesthetic purposes, insurance companies will not cover the cost of the surgery. However, if there is an actual health concern behind the decision, your insurance may cover the surgery. Ptosis, for example, is a common upper eyelid condition that insurance may cover. Because ptosis can directly affect your peripheral and/or central vision, it is important that the patient seek the help of a medical professional. The condition can greatly affect your day-to-day life, causing unnecessary falling in the elderly and making such tasks as walking and driving much more difficult. If left untreated, ptosis can further develop and worsen. Our helpful staff will be happy to assist you in figuring out whether or not your insurance will cover the cost of your upper eyelid surgery, especially as it applies to correcting ptosis. The eyelid surgery usually takes about one to one and half hours to perform, but can range from a half an hour procedure to up to two hours. During this time, you will be put to sleep under the care of a licensed anesthesiologist and will be administered either local or general anesthesia. The results of your surgery will typically be lasting and permanent. A single treatment can be effective for a lifetime. It is Dr. Westreich’s main objective to provide his patients with the most natural, effective results. This means that scarring is always kept to an absolute minimum, so that the patient does not have to worry about potential signs of surgery when considering the procedure. The incision is always placed at the point of least visibility, and, if all goes as planned, will be virtually invisible to both friends and strangers. The downtime after a lower eyelid surgery is relatively minimal. During this time, minor pain, swelling, and bruising is completely normal and even expected. Dr. Westreich typically advises that his New York patients plan to take off about a week from their normal routine to rest and recover, after which time the majority of the swelling and bruising will have subsided. Blepharoplasty is the technical term for eyelid surgery. It involves surgical repair or reconstruction of the eyelids. Blepharoplasty may be performed on the upper eyelids to achieve aesthetic improvements or to improve vision by resolving the obstruction of droopy upper eyelids. How is blepharoplasty different from a brow lift? Eyelid surgery and brow lifts are two surgical procedures performed to restore a more youthful appearance to the eyes and upper face. Upper eyelid surgery removes loose, excess skin and lifts the upper eyelids. It opens up the eyes, making them appear bigger and brighter, and creating a more rested, awake appearance. A browlift, also known as a forehead lift, raises the brow and reshapes sagging skin around the eyelids that can give the eyes a hooded appearance. This procedure can soften the look of the face by removing wrinkles, creases, and furrows that contribute to a worried, frustrated, or unhappy appearance. Who is a good candidate for upper eyelid surgery? Eyelid surgery is typically performed under intravenous sedation or general anesthesia. Incisions are discreetly placed in the natural folds of the eyelids to camouflage incision lines. Through the carefully-placed incisions, Dr. Westreich removes excess skin, fat, and tissue, precisely and meticulously, to correct drooping eyelids and create the desired aesthetic effect. When the procedure is complete, incisions are closed with tiny sutures. What is recovery like after upper eyelid surgery? After surgery, you will have stitches, lubricating ointment, and possibly a bandage over your eyes and will not be able to drive. You will need to have someone transport you to your home and stay with you during the initial phase of your recovery. Depending on the patient and the extent of treatment, full recovery after upper eyelid surgery may take a week to ten days. Are there any non-surgical options as an alternative to eyelid surgery? 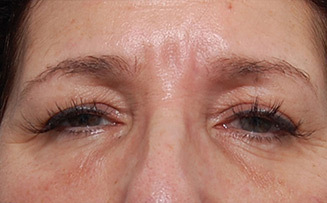 Radiofrequency energy: A “10-minute” eyelift using radiofrequency energy may be an attractive treatment option for patients who want to improve the appearance of droopy eyelids. This procedure uses measured amounts of radiofrequency energy to stimulate natural collagen production and tighten the skin for a lift to sagging, drooping upper eyelids. Fractional laser: This is an effective method for treating fine lines and textural problems around the eyes. It stimulates cell renewal and collagen production to naturally tighten the skin around the eyes. Injectable treatments: Patients have options for non-surgical eyelid rejuvenation, including injections of dermal fillers in the tear trough area to fill in hollows under the eyes and BOTOX to treat crow’s feet, wrinkles around the eyes, and frown lines between the brows. What are the benefits of upper eyelid surgery?